Raspberry Jam and Meringue Cake Louise/Ladies Caprice - sweet and delicate, this elegant dessert is unbelievably delicious. 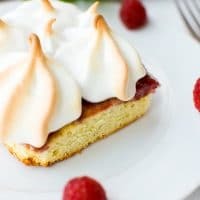 Soft, light and fluffy sponge cake layer, topped with flavorful raspberry jam and lightly baked meringue. Line a 13x9 in baking dish with parchment paper and spray with cooking spray. Lightly flour the bottom and walls. In the bowl of a stand mixed, fitted with paddle attachment cream together butter and 1 cups of the sugar for 3-4 minutes, until fluffy. Add in egg yolks one at a time, mixing to incorporate in between each addition. Add yogurt and mix until incorporated. In a separate bowl combine flour, salt and baking powder. Add flour mixture to the egg yolk-sugar-yogurt one and mix on medium-low speed until just incorporated. (This dough is on the thick side). Transfer mixture to the prepared baking dish, smooth the top and bake for 25-30 minutes, until toothpick inserted comes out clean. After you take the cake layer out of the oven, let it cool for 5 minutes in the pan, then transfer to a flat surface to cool completely. After the cake layer has cooled completely, spread raspberry jam on top. To prepare the meringue topping: Beat egg whites and lemon juice with an electric mixer on medium high speed until frothy. Slowly, while still beating on medium add in 1 cup of sugar. Beat until stiff peaks form. You can either transfer meringue to a piping bag fitted with a star tip and pipe it over the jam or use a spatula and spread a thick layer of meringue. Make sure you evenly cover the top of the cake. Transfer cake with meringue on top to the oven and bake for 2-3 minutes on 400F (200 C). At this time, closely watch the cake, because you don't want it to dry out or the meringue to burn. This isn't exactly a sponge cake layer, since the egg whites were used for the meringue. Keep cake in a cake dome refrigerated for up to 3 days.